I don't think I could actually envisage the day when I managed to sandwich this quilt, but it came today. I put this top together a loooong time ago, at least a couple of years, perhaps more. And it languished while other quilts came and went. I think it's mostly because this was one I thought I might keep for me - so it kept going to the bottom of the WIPs. 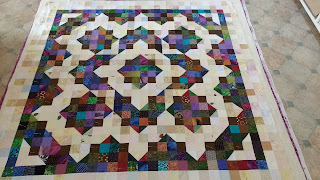 It made up of 2 1/2" squares and is based on one by Debbie Guihot in a copy of 'Australian Patchwork and Quilting' magazine, but I can't find a date on the copy I have. 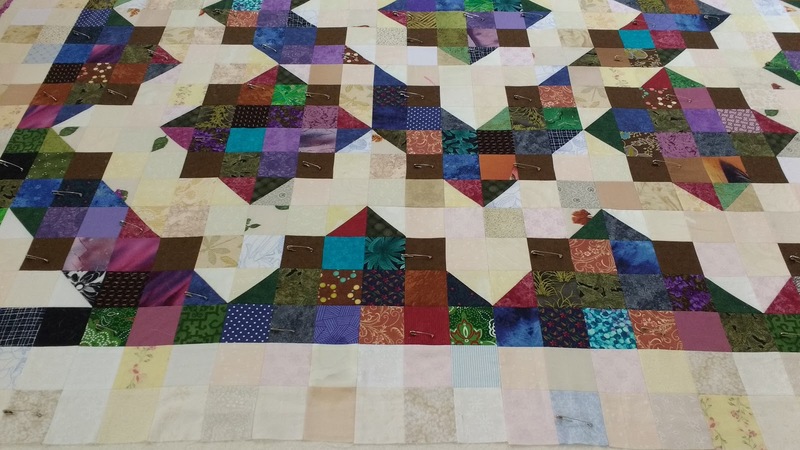 I am looking forward to quilting it with feathers in the cream areas and probably just straight lines in the darker square areas. As I sandwiched and pinned it on my floor this morning, see how the darker areas are really about the same ratio as the cream? Well, what are the odds of me stabbing myself with a pin and bleeding on the darker bits? You guessed it, no, the blood dripped on the cream area down towards the bottom. Fortunately I was able to wet and wipe it out with my magic bar of soap - thank goodness for that. It is now all sandwiched with close to 100 safety pins in it and ready for quilting. This is quilt number 2 on my list of what is a diminishing list of 4 now, with my Indigo quilt almost ready to be sandwiched, my log cabin pieces cut and ready for putting together, and then just that 'bug' quilt that I'm not sure what to do with in terms of borders. Might need to post a photo and see if there are any suggestions to help me along. Oh, I love this! I think I may have found what I want to make with all those scrap squares that have been multiuplying in my scrap bin. 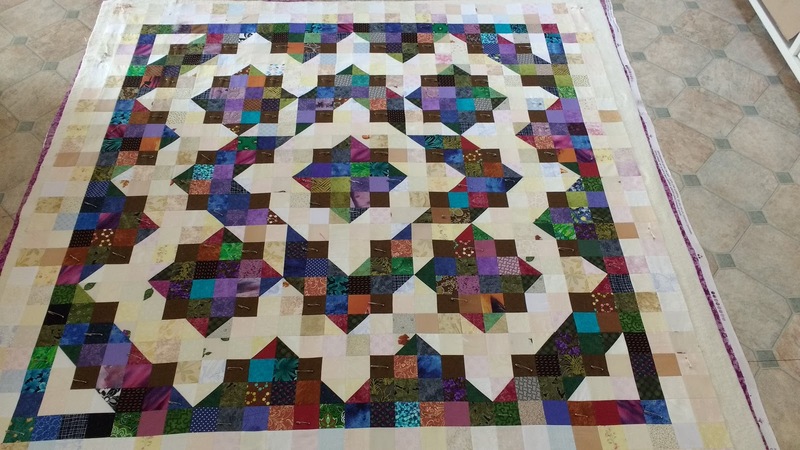 Thanks for sharing this quilt! Its a good one for scraps, only thing is scraps are very good at multiplying when you turn your back! I'm working on another pattern now with some more, good luck with yours. It's a gorgeous quilt and you'll be so glad to have it done. Thanks Cathy, it will be good.